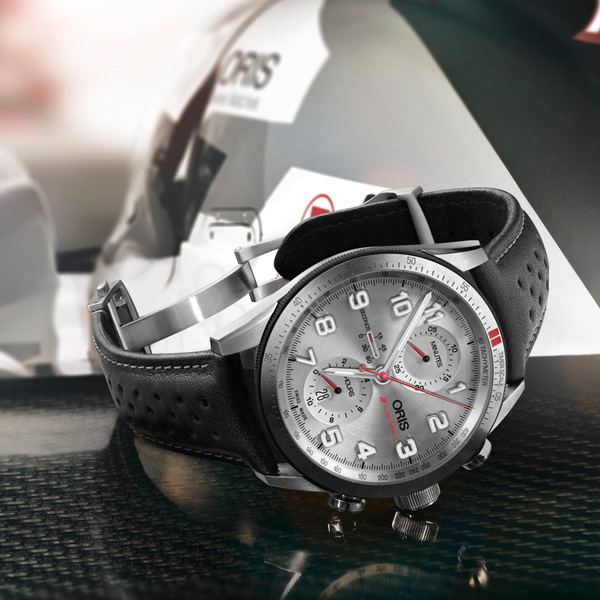 Oris is pleased to present the Oris Audi Sport Limited Edition, launched to celebrate the partnership between Oris and Audi Sport. 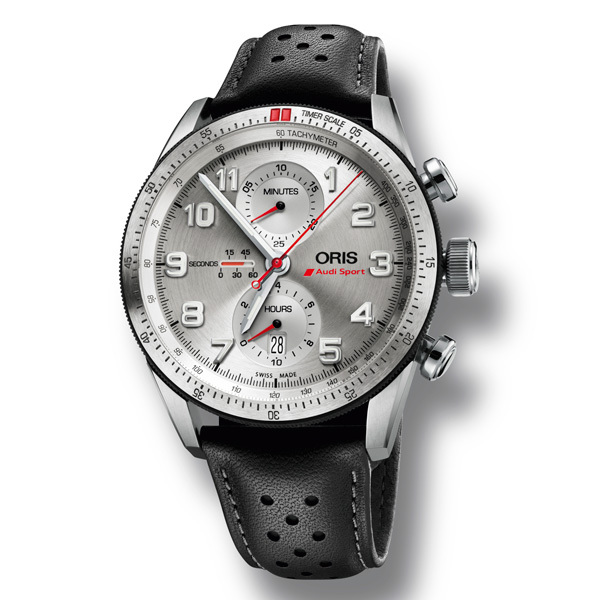 Oris is the Official Watch Partner of the Audi Sport teams taking part in both the FIA World Endurance Championships (WEC) and German Touring Car Championship (DTM), and was part of the Audi Sport Le Mans 24 Hours winning team in June 2014. The new watch is based on the Oris Artix GT sports chronograph, the watch made famous by Oris’s innovative retrograde small seconds function at 9 o’clock. Its design has been tailored to reflect Audi road-car dashboard instrumet panels and is finished in silver, the German marque’s signature colour. The Oris Audi Sport Limited Edition has a titanium case and a tungsten bi-directional rotating bezel, both engineered to make the watch as light as possible, mirroring some of the technologies developed for Audi Sport’s high-performance race cars. The outside edge of the rotating timer bezel has a ‘good grip’ rubber insert, an Oris innovation that improves grip and allows the wearer to make quick, confident adjustments. 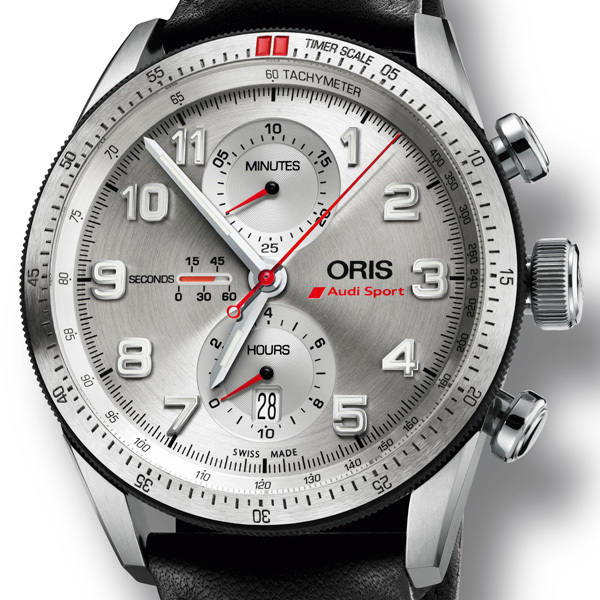 The watch is powered by Oris’s automatic mechanical movement, Calibre 774, which gives the watch time and date functions, and a quarter-of-a-second chronograph. It comes on a perforated leather race-inspired strap, which has a folding clasp, also made from titanium. 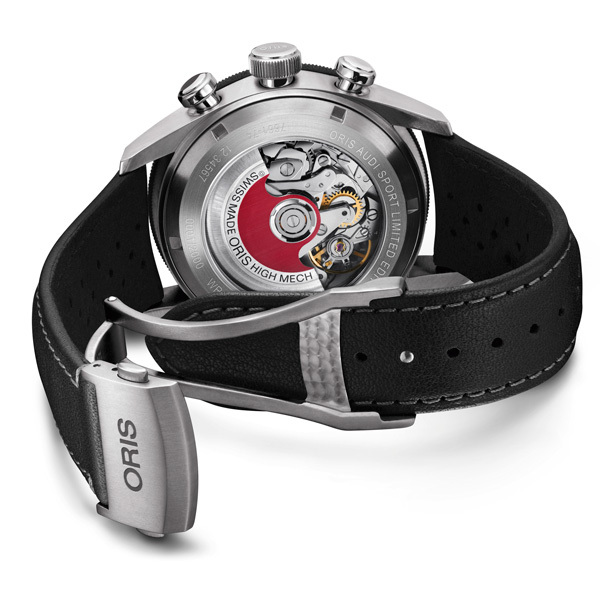 The Oris Audi Sport Limited Edition is presented in a special Alcantara-like box, and is limited to 2,000 pieces.